This September 11, 2011 will be the 10th anniversary of one of the worst days for our country and it's people in recent memory. Tonight as I watched the interview with former United States President, George W. Bush, I couldn't help but wonder just what must have been on his mind at the moment in time when the everyday hustle and bustle of our country came to a halt replaced by terror and fear. As the images appeared on my screen tonight I realized that, 10 years later, they still affect me almost as deeply if not more as the day when we all sat and watched it happen before our unbelieving eyes. My next thought was, this must be how those who lived through Pearl Harbor felt and feel. On that beautiful crisp September morning, the sky couldn't have been more blue. The weather couldn't have been more perfect. It was the kind of day you read about in books, almost near perfect weather wise. That morning my husband and I were still living in New Jersey where we had always lived, in a town called Carlstadt. The house we were renting at the time happened to also be in a flight path due to a small airport in another town near by called, Teterboro. This flight path, although annoying because of the noise of the planes always going overhead interrupting phone calls or the television was until Sept 11th,2001 nothing more than an annoyance you got used to living with. After Sept, 11th, 2001 it became a source of constant fear for quite a while once those of us who lived in the area, realized that, the planes that slammed into the Twin Towers in New York City had flown right over our homes that morning. I remember watching the news that morning like I did every morning, sitting in a chat room on AOL having coffee with online friends from NJ as I also did every morning. When I saw the first plane hit the first tower all of us in that chat room thought it was a terrible accident. When we all saw the next plane hit the second tower, almost in unison, we all typed at the same time, terrorist attack. My husband was in the other room at that moment and I let out with a scream which ofcourse made him come running into the living room.. We knew what we were seeing on the television playing out before us but it was almost to much for the brain to comprehend. Watching the Twin Towers collapse, seeing people jumping to their deaths from the 70th floor of one of the towers and the final collapse of both buildings was more than I personally and I am sure, most Americans could bare. Then there were the surrounding buildings that came down. Then more news that a plane was slammed into the side of the Pentagon in Washington. More lives lost and finally news of Flight 93 slamming into the ground in a field in Pennsylvania with such force that plane and humans were instantly disintegrated. The shock of all these horrific happenings on this day were more than people could handle. After the shock wore off which took about 2 days, fear, deep seeded fear set in for hundreds of thousands of Americans. Myself included. Once planes were allowed to fly again, each time I heard a plane coming overhead at the house, I would duck as if I thought it were going to fall on me. No one wanted to leave their homes, go to work, go to the store. People were psychologically stunned. In the days that followed, then came the images of all the hundreds of Missing Persons posters being put up all over New York, people desperately looking for loved ones. The pleas of those on the news, in tears that they couldn't stop asking if anyone saw someone they were looking for. Jammed cell phone lines, unable to make contact with friends and family. The images of the rescue workers who came from all over the country to Ground Zero in New York to help look for bodies and those we prayed would somehow have survived. These men and women from all kinds of rescue services, all walks of life, working for days and weeks, sleep deprived, missing their loved ones at home but still, they stayed. And then, within a few days, the smell set in. At the time, where we lived, we were approximately 20 minutes from New York City and if we looked out our front window we could see the skyline of New York City and the plumes of black smoke we thought would never be extinguished. There was a smell in the air that lasted for approximately 2 weeks. We had to keep our windows closed. It smelled like a mixture of burning metal, wires and death. 10 years later and if I close my eyes not only can I still see it all I can still smell it and I don't think it will ever leave me. Then, came the news of all the parents who had been killed in New York that day of the children who went to school with my nephews and my niece who were all in grammar school at this time. I don't know if there were many families in this town that were not somehow directly affected with the loss of a loved one. Looking back now, 10 years ago to that horrific day two other people come to my mind. President George W. Bush and Mayor of New York City, Rudy Guillianni. There have been many things said about President Bush and most of it not good but, on that day and the days that followed, I would not have wanted his job for all the money in the world and the decisions he had to make and did make were always with the interests and safety of the American people. He did what he believed was right for the American People and no one can blame a man for that.. I don't know about the rest of the country but for those of us on the East Coast, President Bush and NY mayor Rudy Guillianni were the ones who got us through those first terrible weeks in the aftermath of the worst attack on American soil in the history of our country. In the weeks and months that followed, churches were filled, strangers became friends, people helped each other whether they knew you or not. People were concerned with the well being of other people, friends or not. We were united as one in this country. One people. American people. 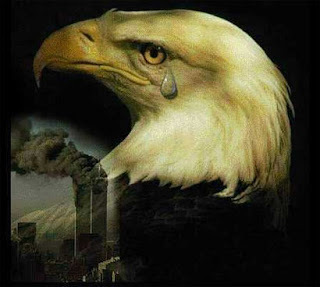 Sadly, now that we are 10 years out from that horrific day, all of this seems to have been lost.. People have forgotten. We have once again become a "relaxed society, falling into that false sense of security". Everything needing to be "politically correct" again. When the reality is, those who committed those disgusting crimes on September 11th 2001 are still out there. Not the same people but those who also believe as they do. They still want all those who do not believe as they do to die and they will stop at nothing to make it happen. On this 10th anniversary I pray people will remember what it felt like that day, go back to church, be kinder to a stranger, be concerned with another's welfare and stop the misdirected compassion and tolerance. I am not saying people shouldn't be compassionate or tolerant. What I am saying is, study your conscience. Is your compassion and tolerance misdirected? There are many more thoughts I could write about September 11th, 2001 but for myself, as I am sure for many others as well, those events are still to painful and the wounds unhealed. Where were you on September 11th 2001? What was your experience? How do you feel about it all today? Please use the comments to express yourself.